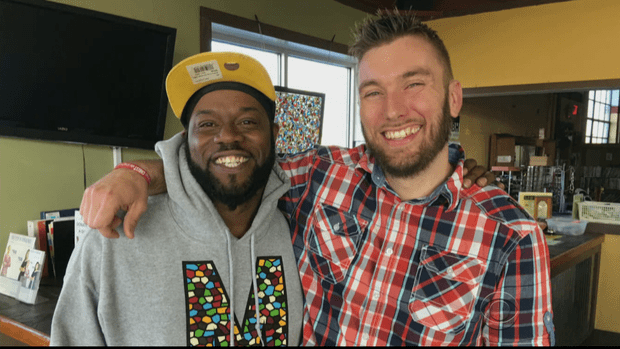 The bad white cop and the innocent black man– why are they smiling? While many non-Christians in our society are becoming increasingly anti-Christian, the power of Christian forgiveness can still astound and inspire everyone. No other belief system has the equivalent of forgiving your brother “seventy times seven,” much less commands you to love your enemies, and bless those who persecute you. This radical nature of Christian forgiveness is so startling and so overwhelming, that it made the CBS Evening News. It all went down on a block in Benton Harbor, Michigan. Back in 2005, Jameel McGee says he was minding his own business when a police officer accused him of, and arrested him for, dealing drugs. “It was all made up,” said McGee. Of course, a lot of accused men make that claim, but not many arresting officers agree. “I falsified the report,” former Benton Harbor police officer Andrew Collins admitted. “Basically, at the start of that day, I was going to make sure I had another drug arrest.” And in the end, he put an innocent guy in jail. Eventually, that crooked cop was caught, and served a year and a half for falsifying many police reports, planting drugs and stealing. Of course McGee was exonerated, but he still spent four years in prison for a crime he didn’t commit. Today both men are back in Benton Harbor, which is a small town (population 10,000). Maybe a little too small. Last year, by sheer coincidence, they both ended up at faith-based employment agency Mosaic, where they now work side by side in the same café. And it was in those cramped quarters that the bad cop and the wrongfully accused had no choice but to have it out. “I said, ‘Honestly, I have no explanation, all I can do is say I’m sorry,'” Collins explained. Today they’re not only cordial, they’re friends. Such close friends, not long ago McGee actually told Collins he loved him. “And I just started weeping because he doesn’t owe me that. I don’t deserve that,” Collins said. But he didn’t forgive just for his sake, even for Collins’. “For our sake,” McGee said. “Not just us, but for all our sake.” McGee went on to tell CBS News about his Christian faith, and his hope for a kinder mankind. He wants to be an example; so now he and Collins give speeches together about the importance of forgiveness and redemption. And clearly, if these two guys from the coffee shop can set aside their bitter grounds, what’s our excuse? Collins is right when he says forgiveness, and the healing it brings in its wake, has nothing to do with “deserve.” As McGee, a Christian, understood, we forgive one another because, as Paul told both the Ephesians and the Colossians, God in Christ has forgiven us. There is a power at work here that even the most hardened skeptic cannot deny. Romans 12:14 — Bless those who persecute you; bless and do not curse. Ephesians 4:32 — Be kind and compassionate to one another, forgiving each other, just as in Christ God forgave you. O God of love, who has sent us a new commandment through your Son Jesus Christ, that we should love one another, even as you have loved us, the wayward and unworthy, and has given your Son for our life and salvation; grant to us, your servants, in all the time of our mortal life, a mind forgetful of past ill will, a pure conscience, sincere thoughts, and a heart to love and forgive others. Amen. —The Book of Common Worship, (Presbyterian Church, USA), Westminster, 1906, (altered), originally from The Liturgy of St. Cyril (fourth century). This entry was tagged forgiveness, Stories, witness. Bookmark the permalink.